#1 Cleansing- Wash hair on a regular basis. Alternate between clarifying and moisturizing shampoos. Natural hair tends to be dryer than straight hair so using one type of shampoo maybe drying or over moisturizing. To keep a balance alternate as often as possible. Clarifying shampoos gives your hair a fresh start by removing deposits (hard water, cremes, hairspray, gels, chlorine, etc) and restoring shine. Moisturizing shampoos gently cleanse the hair while replenishing hydration. #2 Conditioning- After your wash, avoid applying conditioners and cremes to your scalp. 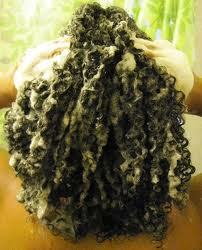 Conditioners/cremes are only made for the hair shaft and can clog the hair follicles which results in stunted growth. #3 Nutrition- What you put in your body is just as important as what you put on it. Anti-oxidant rich foods like fresh fruit and green vegetables help to keep your body and scalp healthy. Products such as fish, nuts, , milk, peas and beans promote hair growth. #4 Massage- One of my favorite things to do. Massaging the scalp with your finger tips stimulates blood flow, nourishes your hair and relaxes your muscles. #5 Avoid Heat- The same way sunlight can burn your skin so can excessive heat from hair dryers. Hold blow dryers a good distance away from hair/scalp. If you experience any discomfort from drying your hair then the dryer is too close to your hair/scalp. We want to hear from you with your natural hair! BREAKING NEWS: Whitney Houston dies at 48.